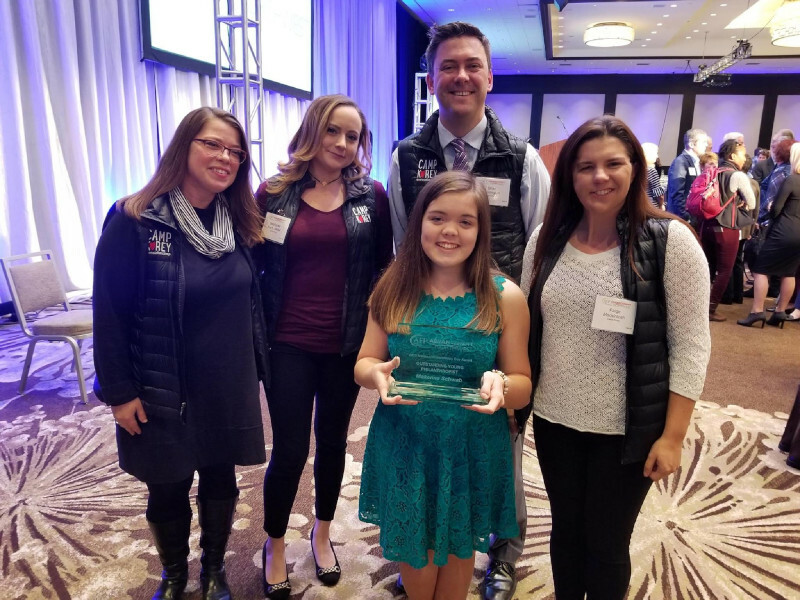 On November 1, Camper Makenna Schwab was recognized at the AFP/Advancement Northwest National Philanthropy Day luncheon, receiving the Outstanding Young Philanthropist Award. Makenna annually raises funds for Camp Korey, Seattle Children’s and other nonprofits through her MakSpire Foundation. She received a beautiful award on stage in front of hundreds of local fundraising professionals and organizations. During her remarks, she shared with the room what an important place Camp Korey has been in her life and how much she cherishes the friendships and bonds she could have only formed at Camp Korey. Staff were in attendance to celebrate her! This entry was posted in Camp News, Camper Spotlight. Bookmark the permalink. ← Team Korey Member Organizes Inaugural Trick or Trot!